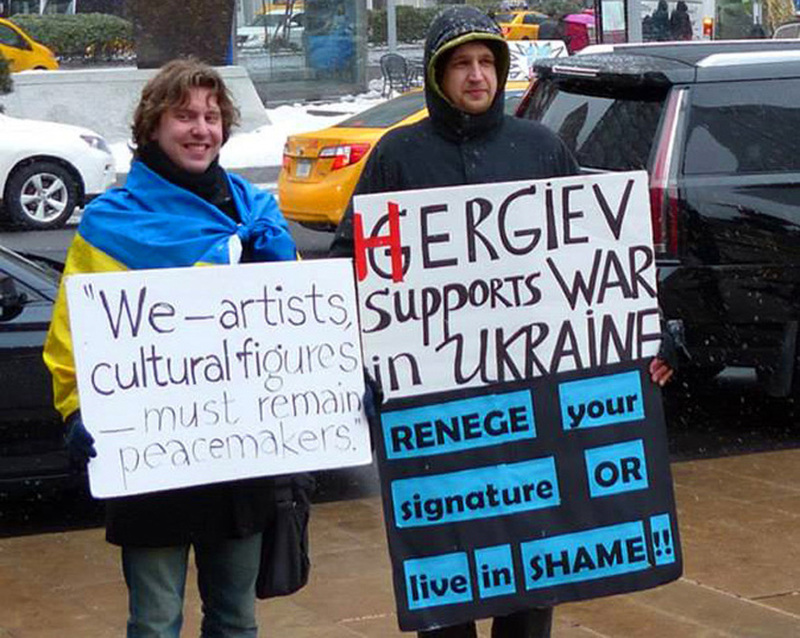 A wave of protests accompanied Russian opera singer Anna Netrebko and conductor Valery Gergiev throughout the string of their North American performances. Both of them earned the ire of Western audiences for openly endorsing Vladimir Putin’s forcible annexation of Crimea and covert invasion of Ukraine. Gergiev signed the controversial “letter of support” for Putin’s aggression, while Netrebko fraternized with terrorist leader Oleg Tsarov, who was sanctioned by both the U.S. and the EU. Tsarov was sanctioned by the United States as a person who poses a threat to national security. Executive order signed by President Barack Obama with respect to the sanctions stated that “the actions and policies of persons including persons who have asserted governmental authority in the Crimean region without the authorization of the Government of Ukraine that undermine democratic processes and institutions in Ukraine; threaten its peace, security, stability, sovereignty, and territorial integrity; and contribute to the misappropriation of its assets, constitute an unusual and extraordinary threat to the national security and foreign policy of the United States.” Netrebko could face U.S. sanctions for providing material support to Tsarov as a sanctioned individual, since the Presidential order specifically prohibits “the making of any contribution or provision of funds, goods, or services by, to, or for the benefit of any person whose property and interests in property are blocked pursuant to this order.” The opera star owns residential properties and spends extensive time periods living in the United States. Protesters, many of whom are musicians themselves, continued to make their presence known at every performance of the controversial duo. Their Valentine’s Day presentation included a card to Anna Netrebko “from broken hearts in Ukraine” and a garden of crosses, symbolizing death and destruction caused by Russia’s politics of aggression. 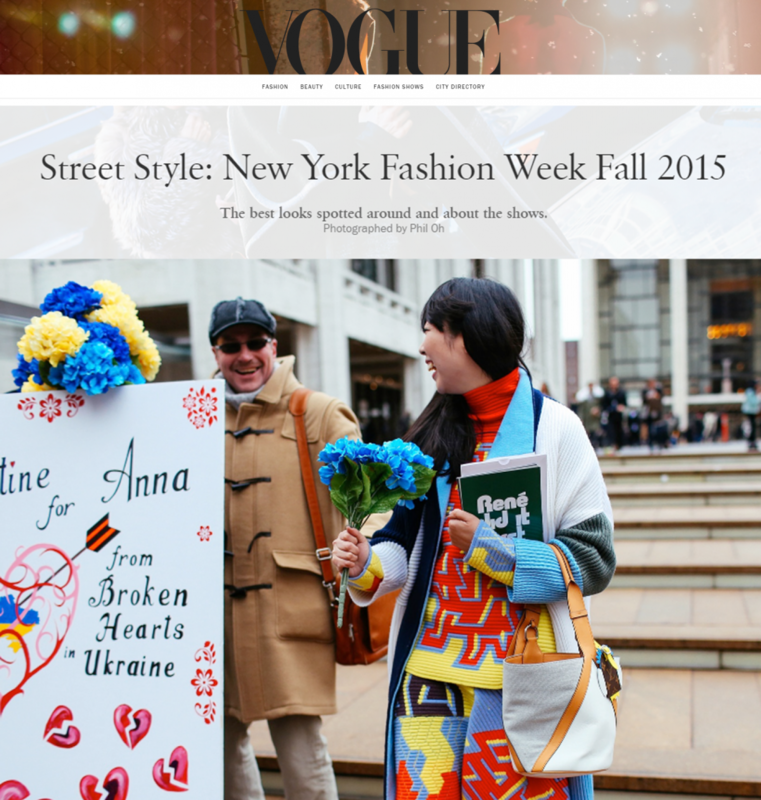 The protest coincided with Fashion week, landing Netrebko’s Valentine in Vogue magazine. In the meantime, another creepy crooner, Iosif Kobzon, was sanctioned by the EU for supporting draconian anti-Ukrainian policies of Russia’s President. The EU also added three Russian military leaders and prominent Ukrainian separatists to the same sanctions, for a total of 19 individuals and nine organizations. Russian deputy Defense ministers, Arkady Bakhin and Anatoly Antonov, were sanctioned for their involvement “in supporting the deployment of Russian troops in Ukraine”. Andrei Kartapolov, Deputy Chief of the general staff of the Armed Forces of the Russian Federation was sanctioned for being “actively involved in shaping and implementing the military campaign of Russian forces in Ukraine.” Sanctioned organizations included the “public movement” Novorossiya (New Russia), which was established as a front for the main intelligence directorate of the Russian general staff and was led by a Russian intelligence officer, Igor Girkin (also known as Strelkov). Iosif Kobzon is no stranger to controversy. He gained prominence in the USSR under the helm of Leonid Brezhnev and was reportedly linked to a Russian mobster, Vyacheslav Ivankov (nicknamed “Yaponchik”), who died in Moscow in 2009 from multiple bullet wounds. Because of his mafia ties, Kobzon has been repeatedly denied a U.S. visa, which he tried to obtain almost every year since 1994. As the so-called “ceasefire” in Ukraine continues to unravel, more stringent sanctions are sure to follow from the EU and the U.S., penalizing not only terrorists, but also their sponsors, military advisors and supporters.